Please note: Please arrive a few minutes early to sign in at the front desk of SOAS Senate House North before proceeding to the lecture theatre. If you cannot join us but would like to make a donation to the work of the British Refuge Council, please click here. 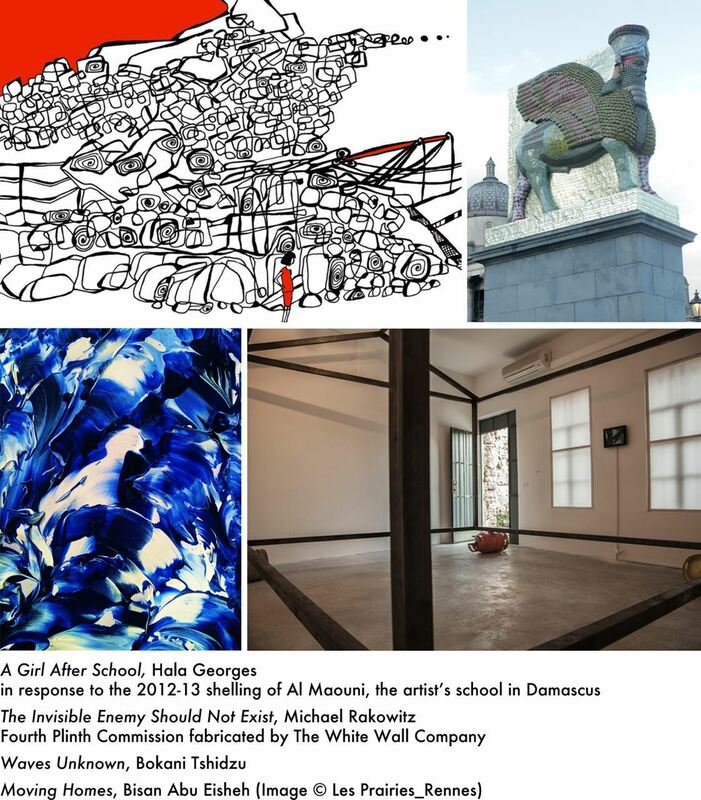 The YCL Art Circle hosts artists Bisan Abu Eisheh, Bokani Tshidzu, Hala Georges, and Edward Oliver of The White Wall Company for an evening of conversation on the current refugee crisis as seen through the lens of the visual arts as individual practice and international collaboration. The evening begins with presentations of art work and practices that respond to current events and proceeds to a panel discussion including musician Kamilla Arku, YCL coordinator for Day of Service 2018 in partnership with the Children’s Section of the British Refugee Council. Joe Jakes who manages the BRC's Youth Development Project will be in attendance to take part in the Q&A as the conversation opens out to include Yale Club London members and guests. Join us for an evening of engaging exchange with Yale Club members and guests that will also raise raise much-needed funds for the Children’s Section of the British Refugee Council. Bisan Abu Eisheh is an artist who lives between Jerusalem, Glasgow and London. He uses art as a tool to investigate history, society and politics. Abu Eisheh’s works has been shown at major institutions and art events including The Palestinian Museum, Moscow Museum of Modern Art, Glasgow International, Eva International Biennial, the ICA, and the Istanbul Biennial (2011). Bokani Tshidzu is a painter whose technique involves urgent, gestural movements, exploring and responding to colours as they interact on the canvas. Painting has empowered her to move past the childhood loss of both parents to resolve questions of global female identity, black African heritage and belonging. As a contestant in the BBC1 series The Big Painting Challenge, she won the first public vote. Edward Oliver is a senior designer at The White Wall Company, where he worked as the lead designer on Michael Rakowitz’s Fourth Plinth sculpture, The Invisible Enemy Should Not Exist. He is also an artist and photography lecturer at University for the Creative Arts. Hala Georges is an artist and educator, researcher and activist. Her most recent work explores a personal perspective on the current Syrian crisis via mixed media of documentary and experimental film and illustration practices. She is also a senior lecturer in Graphic Communication at the University of Northampton. Kamilla Arku (YC 2005) is a concert pianist, teacher, founder of Music for Liberia and recipient of the Jack Petchey Outstanding Leader Award for her service to young people.